Welcome to the website of A.C. Weiss GmbH & Co. KG. 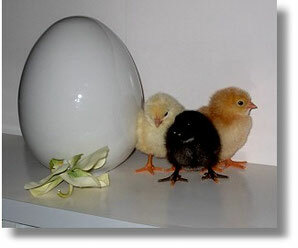 We are an independent poultry breeder, supplying high quality hatching eggs, day old chicks or carefully reared 18 week old layers with a lot of experience in this branch. Beside our own hatchery we also have parent stock, for this reason we can offer you a complete range from hatching eggs to one day old chicks and layers of our own breeding. Our rearing facilities comprise of aviary and biological systems (Bioland member DE-ÖKO-006). Whatever your production system, we can raise the right layer for you.